BVAR interested in hosting week 4? We will host for sure but we are only a 50man server will that be ok? I'm hoping we have a clear night from DDoS attacks, tomorrow night. It's starting to get on my nerves! and it's ruining it for everyone. It's not to late to get involved. Post up in this thread or drop me a PM. We also need to hold a discussion regarding the timing of the event moving forward. We know the map yet? Would it be on twitch? Where is the link to watch? Ah well, have a wee look at the scores to keep youselves entertained. It was great night,i wanted one more round. What time does it start and where can I view this event? Not sure if it was being streamed, most likely some videos will come out. Happened tonight mate, started at 20:00 GMT so long finished. What channel? Youtube or Twitch? Wow. How many people. We could of filled a 100 slot server and then some! Good show from all that turned out, sorry to those who didn't get a game. The event was hosted by [RIP] Rusty In Places who did an excellent job. We only managed one full round this week, played on Chora. Not sure what happened to the second round​. RussUK streamed the event from his perspective. I'm not sure if anyone else did? Any clan interested in hosting the next event should drop me a PM, another 72 slot server would be ideal. Any Devs listening maybe you could hook us up with something a little bigger to test for you? With the increase in numbers we'll get more organized for future events and will introduce a few guidelines for participation. 1) Confim your clans attendance to the event on a weekly basis in this thread. 2) Each Clan can bring a maximum of one squad, nine players, to the start of the event. 3) Turn up at 1940hrs GMT to allow plenty of time to balance the teams. 4) Once all confirmed clans are present on the server any remaining free slots will be divided between clans. A final balance will follow before start. 5) Game to start at 2000hrs GMT promptly. 6) If server goes down on map change. Exit the game, rejoin the server and your appropriate team. 7) Clan reps join the steam group chat. Anything I've missed please inform and it'll go on the list. Also how is the 2000GMT start for everyone. I've had a little bit of feedback that it may be too late? The majority don't seem to have an issue with the day and time, is that correct. Speak up. As always BIG shout to all that turned out. 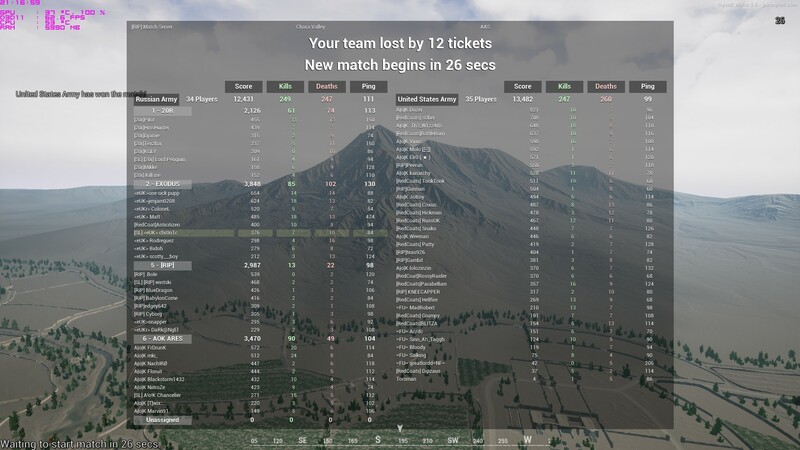 We joined but only managed to get 7 players in game due to user crashes and various map freezes...etc and obviously the server got full then the server crashed. After the restart we managed to get in a full squad +some (around 12 players) but others that were in before the server crash wanted in and since we didn't have a full squad if we went back to the previous start decided to leave and let other groups play. Sorry if this caused you guys any issues but we didn't have a huge amount of players in comparison to others so thought best let you all thrash it out and looking at the scores, looks like a close match! We are still up for hosting next time but as stated we are a 50man server but can and will increase to 54 so we can have an even 3 squads per team. Regarding start times, I myself don't mind however I have had feedback from others that its too late on a Sunday with most having work the next day and would like it moved forward 1 hour to 1900hrs this should allow for family time but also ensure we get in the full 2 rounds per match. no,72 server is now to small for us. We discussed the time issue and was suggested 1930 for kick off promptly due to allowing the UTC + 1 guys 30 minutes earlier start but also allowing UK clans time to deal with families or even getting home from work and getting some grub down their necks. As time moves on we should as a whole get more slick, well done to everyone that attended, as always great fun, and pleasure as always! For those reading this that aren't part of a clan, you really don't know what you are missing! Playing on a server where you know everybody is playing the game properly and you don't have to worry about idiots or hackers in-game. It's just a fantastic feeling and an amazing atmosphere! Understandable that you feel 54 player server is too small but you must take in consideration of the clans server and also performance. We also understand that a lot of clan members of certain clans would like to participate but once a server has more spots then the performance of the server can somewhat become unstable (risk heightens). The end goal of course would be 100 players, 50v50 but some servers that handle that cannot go a full game without some sort of crash. We will be in discussion this week on the final number of the server but at the moment we were looking at a 3 v 3, each clan has 9 man squad, clans put best members forward and rotate in round 2. clarification may be given by other BVAR members in regards to this post. why doesnt host someone with server 72 then? Don't stress about the host. It'll get sorted and posted up before Wednesday. We already have a few offers. If we start going to 72+ then I would think the majority of Red Coats would refrain from playing. Last night really was a struggle performance wise and not enjoyable for the most part. Obviously going forward there may be improvements, but for the minute, 72 really is the maximum we feel we can play on effectively.